My name is Raquel and I’m originally from Sun Prairie, although my parents are originally from Puerto Rico. I’m a Personal Trainer/Instructor, Reiki & Healing Practitioner, Spiritual Advisor, and now an ordained Minister! A quick backstory: The majority of my life was filled with an abundance of self-hatred and self-harm. A lot of this came from struggling to accept myself as a two-spirited soul experiencing life through an obese, female body that I didn’t 100% identify with. After hitting rock bottom, I decided enough was enough—which led to my first weight loss of about 85 lbs. Ironically, I believed this was the answer to fix all that was unstable within me. If only it were that simple! After a few years I gained almost all the weight back and found myself in a similar position. I found myself back on the journey toward physical health when I joined a local fitness facility that taught me a lot about functional fitness and athleticism. I re-lost all the weight and eventually became a trainer and instructor there. Over of the course of four years I had found a niche and my true passion: helping heal people while spreading the love! What’s FORWRD all about? What motivated you to start it? FORWRD is a school of training. We teach humility and patience in all things, which leads to true strength and self-empowerment. At FORWRD we strive to offer a genuine safe space for all humans to learn and bring awareness to the present, to help heal, be well, and strengthen all aspects of who we are, and truly honor that. There is no room for negative mindsets, unhealthy egos, or unrealistic expectations. FORWRD came about as the end product of a project created by myself and my brother-in-law, Joseph Krebs. He approached me a couple years ago when I was unhappy at my job, and now here we are! What are some of the challenges of your work, and how do you work to overcome/deal with them? The false perception/belief that over-training means better results; that faster is better, and high-level dynamic training should be a goal we all strive to achieve. Throw in a side of competitive ego and there you have it—it makes me want to rip my hair out. FORWRD’s approach aims to target, redefine, and extinguish these limiting and often unrealistic negative mentalities. The approach works to rewire unhealthy patterns associated with health and fitness expectations. This teaches patience for the self and giving the body permission to be at, and work from, its current state rather than imposing unrealistic expectations on it without reason. Our program is designed to filter out this sort of negative approach. What are some of the best parts of your work? What motivates you to keep at it? Seeing first-hand the personal and emotional growth and healing occurring in each individual. I want people to discover their own version of what I’ve found in myself: genuine love, joy, happiness, healing, and strength. It is attainable! Seeing these changes occurring motivates me more than anything. There is something quite rare and transformational happening here at FORWRD, and it is beautiful! Why is this kind of gym/training program important and/or unique, do you think? What role do you see it playing in the community? We allow space for and encourage the patience and humility that’s required for long-lasting results. There is no ulterior motive other than to help you continuously move forward. One of the unique things you can find at FORWRD is how we are 100% LGBTQ inclusive! Over 90% of our members identify as LGBTQ. We are proud of the genuine safe-space environment and community being cultivated here. Another thing that sets us apart is how initial assessments are required to participate, but we also don’t do weigh-ins or body-fat tests. 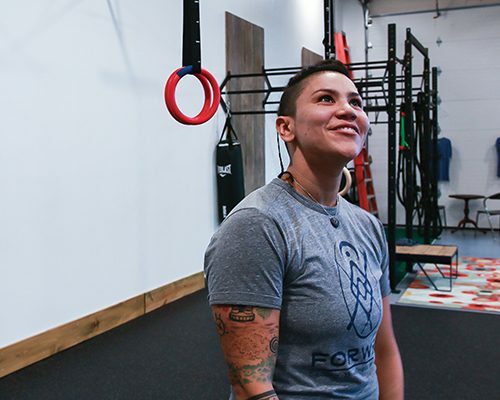 One of FORWRD’s main roles is to redefine what it means to be strong and healthy with a more realistic approach, rather than focusing on the superficial as a gauge for results or success. Why should folks sign up with you all? And where should they go for more info? Because we can truly tailor an appropriate training regimen dependent on your needs and life-stresses. This is perfect for the person wanting to begin their journey toward a healthier approach to fitness and wellness, but also a great way to supplement higher-level training athletes who may be tight or in pain from their sport and simply want to prevent plateauing and/or injury, and to excel in their own training. Knowledge is power, and here at FORWRD we will in empower you with the knowledge and application needed to successfully move FORWRD on your journey! E-mail me at raquel@forwrd.training, facebook.com/Forwrd.training. Schedule a free consult and get some passes at Mind Body Online: search “FORWRD Training” or go to our website at forwrd.training.